At long last… our house is finished and we have moved in! We are just bouncing off the walls rejoicing. We have been getting settled for the past couple of weeks. As we sit in our new house now, we reflect back on how it all began. Preparing to head to Burundi in 2015, we began wrapping up our lives in Missouri and planning for our future in Africa. I admit I (Julie) was quite overwhelmed with the thought of having to not only part with most of what we had, but also decide what I think we might need in the next 5-10 years. If you’ve ever moved, you know it involves many runs to the store (Target, Home Depot, etc) to grab whatever it is you need for that day’s project. Imagine having to think 3 years ahead of your move and trying to be prepared to completely set up a house without any store to run to! That’s right, even Wal-Mart hasn’t quite made it to Burundi yet! Knowing full well my strengths and weaknesses, I called on a few key friends who are whizzes at organization and we began going through my house, item by item, giving it a “yes” it’s going to Africa or a “no”. We packed all the “yes” items in bubble wrap, hand towels, fabric scraps – anything cushiony – and put them in wooden shipping crates. Cup by cup, plate by plate, we packed for days. And then we had to think ahead and purchase things like bug-proof mattress covers, clothes for the kids in sizes for years to come, future Christmas presents, tools, nails and screws… Really anything you think you might use in any part of your house for the next 5 years! These items, plus couches, mattresses and a few chairs were packed into our portion of a shipping container. The container sat in Texas in 2015 while we studied in France, then it made the long journey across the Atlantic Ocean, the Horn of Africa, on land across Tanzania, and finally to Kibuye. Without cranes or tools to unload it, our local workers relied on teamwork, rhythmic chanting, and a lot of manpower to unload it. 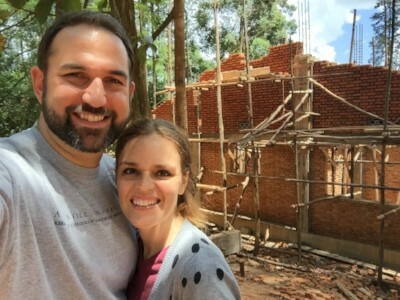 When we arrived in Burundi in the fall of 2016, there was a national hold on all construction work, so it became clear that it would be a while before we could start building our house. We unpacked a few keys things from some of the crates, and settled into one of four adjoined apartments in our compound. Then we broke ground in the fall of 2017 with prayer, excitement, and a little nervousness on my part. The months passed with anywhere from 50-200 local workers each doing their part on a given day. Without backhoes, cement trucks, or any other major machinery, these men built the house from ground up completely by hand. Because termites are an issue in Burundi, houses are made of brick, cement, and steel. No wood frames or dry wall. Likewise the floors are not hardwood or carpet, but rather concrete or tile. Logan and I have never built a house before, so we felt completely out of our comfort zone. We couldn’t have done it without the help from our team’s long-term missionary engineer, Caleb Fader, with whom we met every week. He guided us through the entire process, step-by-step through both the big and small decisions. We can’t say enough how thankful we are for his expertise during hundreds of decisions, but even more so for his patience and guidance as we fumbled our way through this process. Building a house in Burundi is simultaneously simpler, and more complicated, than building a house in North America. It’s complicated because water heaters, metal for the roof, and other large necessary items have to be imported from Kenya, Egypt, or Tanzania. But some things are more simple because we have fewer resources. Choices like “what do you want your door handles to look like?” are very easy because there is basically only one option! Choosing a kitchen sink was easy because there were only two options available! The same with toilets or bathtubs... is it Toilet A or Toilet B?… Done! Easy! Purchasing tile was a little more complicated. In the states, you go to Home Depot where they have sample tiles you choose from and then they can order however much you need! But here in Burundi, the shops don’t get to choose their stock. From what I understand tiles are just brought in on trucks from other surrounding countries and that becomes what they sell! So, we went to one of the largest stores and ended up in their warehouse to see first hand what our options were. Given the square meters we needed, that narrowed our selection down quite a bit! But, I took a deep breath and we made a choice! The supply was almost perfect, but we realized we were a little short after the job was almost finished. So I returned to the capital city and searched every little shop trying to find a match for the tile I had chosen months earlier. No luck. I couldn’t find a match, so I chose a completely different pattern which now it accents the other flooring. C’est la vie! One of the most difficult things for me was designing and drawing the plans for our kitchen cabinets. Don’t get me wrong, I loved looking at pictures of kitchens on Pinterest, but deciding what we want and then measuring to the millimeter and trying to draw it out to scale was way out of my range of skills that God gave me! We hired a local carpenter to build for us, but keep in mind that a traditional Burundian kitchen looks nothing like a traditional Western kitchen so he is working outside of his comfort zone as well! 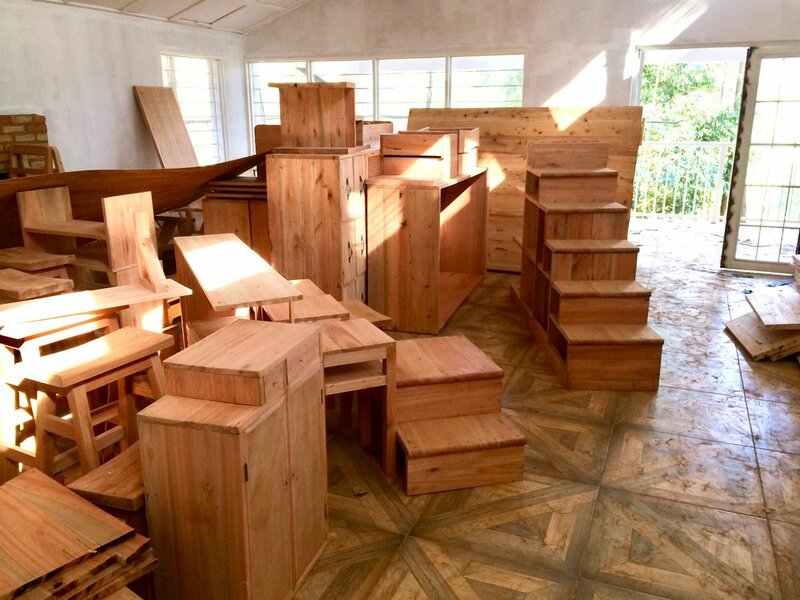 All the furniture stacked in our living room ready to be put in its right place! So now everything is built, and we are almost completely moved in! I’m having fun decorating with what I brought with me from our old house in Missouri, as well as what I’m finding here. For side tables in our living room, we are repurposing a eucalyptus tree that was cut down during construction and our mantle is a piece of another tree that came from another part of the compound years ago. Because our house was built on a hill, that made two things possible: 1. We have an amazing view of the beautiful Burundian countryside. 2. We were able to incorporate a guest apartment below our house. I’m so excited about it! It is a 2-bedroom space with a separate entrance, bathroom and kitchen. It’s also a bonus spot for team gatherings such as Thanksgiving! I look forward to hosting not only our own team and Burundian community, but also visitors from the US or other missionaries in Burundi looking for a quiet place to relax. When the construction was complete, we were able to celebrate with all the people that had a part in building our house. All the construction workers were there, we roasted a big cow and had a celebratory feast! We were also able to bless the workers with a new hat, which they loved, donated from team supporters in Michigan. We're "Home" for three months!! "Qu'est-ce que tu aimes faire?" means "What do you like to do?" You won't hear about video games, movie theatres, museums, or bouncy houses... but these kids sure do know how to have fun. Watch this short video Julie made of the 1st and 3rd graders at Kibuye Hope Academy to find out what they like to do! 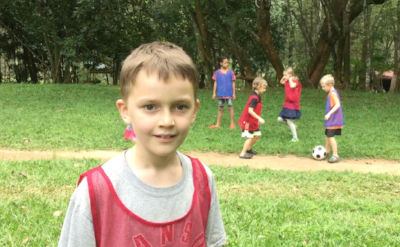 If you don't speak French, enjoy a quick lesson on the must-know verbs among the kids at Kibuye! 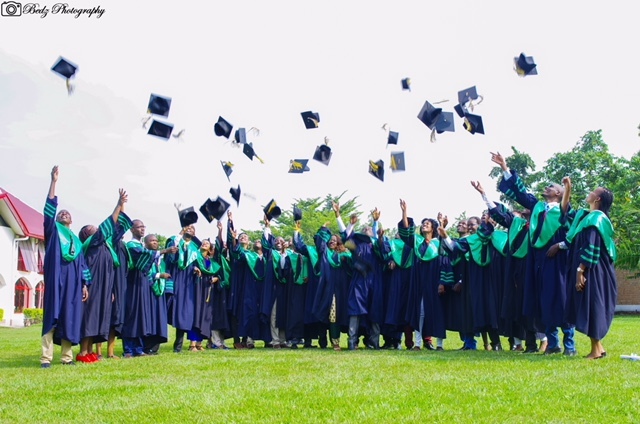 Hope Africa University held its graduation ceremony in January just before we left. It is so exciting that 79 new doctors graduated! 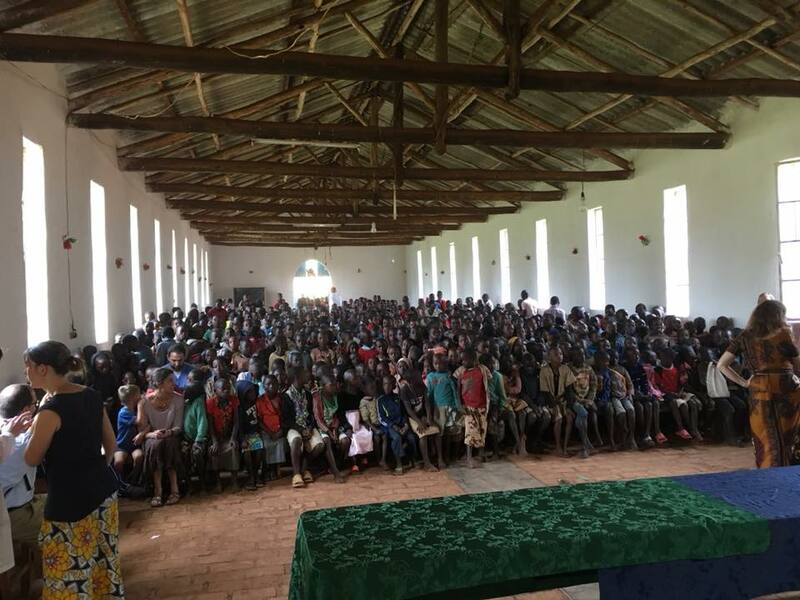 This means 79 more physicians to care for the poor and needy in Burundi, and also in neighboring countries of Rwanda, Congo, Uganda, and Cameroon. Please pray for them as they get started in their careers. It is still a long road ahead for many of them as they seek internships and/or look for job opportunities. 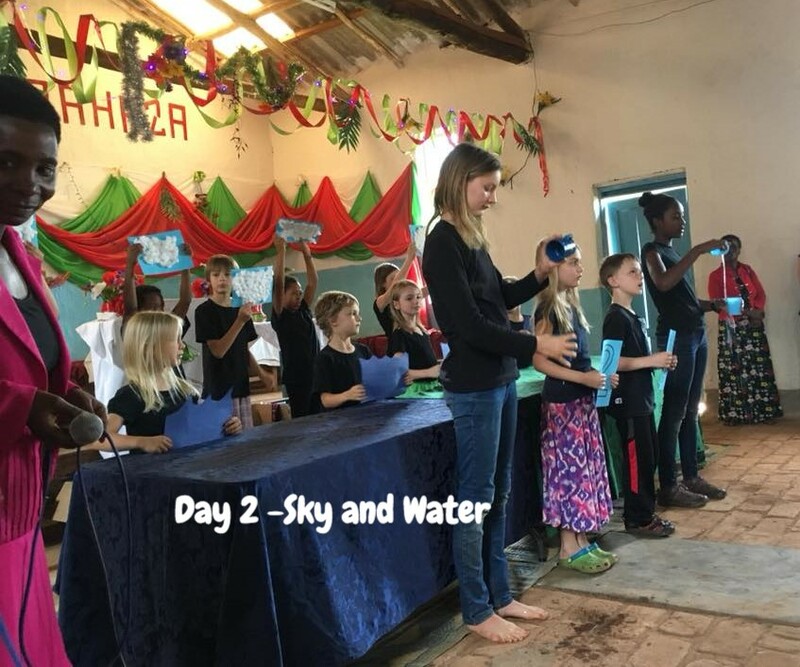 Julie and the kids recently presented the story of God's creation of the world to the local school children. It was an fun operetta with one song per creation day, almost like a human puppet show with the kids popping up from behind a covering with fun props and lots of silliness. 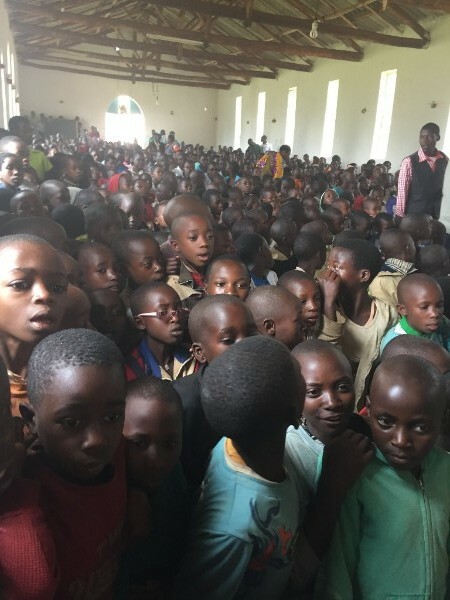 Over 1000 Burundian children crowded into the local church to hear and see the fun program. It was interactive as our kids took turns saying what God created each day (in Kirundi), then taught the local kids the words in English. 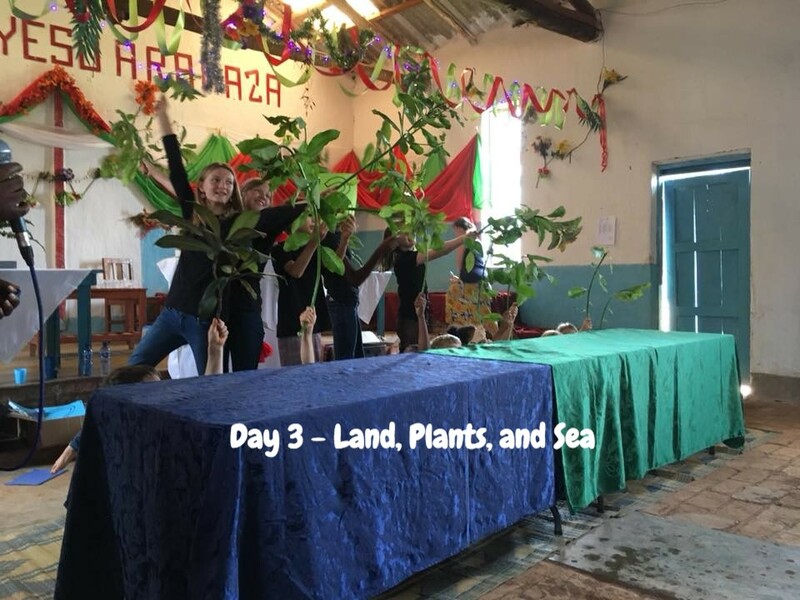 Our kids made paper props, learned danced moves, and practiced for hours to do the best job they could, with the resources available, to show the local kids the beauty of God's creation. The local school children were so excited, they crowded around to get as close as they could to the action. ALSO in Burundi for the first time! 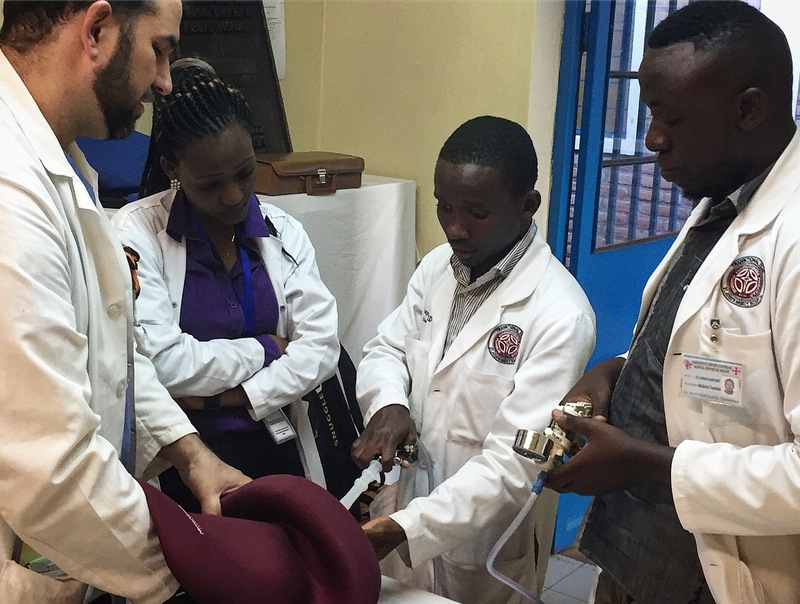 Logan was excited to be able to offer the Advanced Life Support in Obstetrics (ALSO) course to the generalist physicians that he works with at Kibuye Hope Hospital. They all participated and did a great job. Hopefully these skills will help advance maternity care for the patients at the hospital! We would love to see as many of you as possible! Unfortunately three months just isn't enough time to see ALL the people we would want. If we saw one friend and supporter everyday we are in the States, we still couldn't see everyone! But we want to try and see you, give you a hug, answer any questions you have and most importantly, say THANK YOU for your support of our ministry in Burundi. Sunday February 25, 10:40 service, with a potluck to follow at 12:30. If you can't come to the church service, feel free to come to the potluck! You might see Logan around CoxHealth, teaching at the Residency for six weeks, between March 12 - April 20. Text him at 417-319-6111 to grab coffee or lunch. He will be giving an update on our work in Burundi on Friday, April 27th, 2018 at 10:15am. 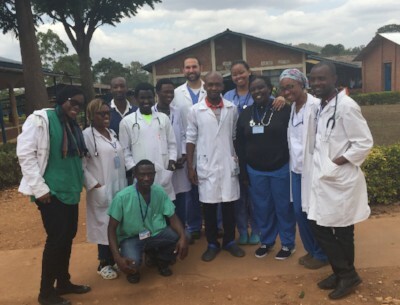 Logan will be at the Society of Teachers of Family Medicine (STFM) Conference in DC, May 5-9, and he will be presenting about our work of rural clinical medical education in Burundi. If you, or your group, would like to host us, please let us know! We would love to share what God is doing in Burundi. House construction is moving along! It has been fun to watch the process step-by-step as the work on our house moves forward. We are going to take a break on construction during our time in the States, so we hope to finish sometime this fall. If you'd like to be one of the first to come visit Chez Banks, let us know! We want to say thank you to the many people who are helping make this calling a reality. We couldn't be doing this without your ongoing support! THANK YOU!! We could not do this without the prayers and support of so many people. We pray you are blessed through the sacrifice you are making to support medical education and discipleship in Burundi! We are blessed to be supported in a major way by our home church in Springfield. If you'd like to support us through the church you can do so here. This was our first Christmas in Kibuye, Burundi. It was simple, yet full. We started a new tradition, inspired by a friend, in which we spent our Christmas Eve dressed as shepherds, eating shepherds pie, and enjoying the beautiful African star-filled sky. Logan read the Christmas story and we imagined we were just like the shepherds who were the first ones to receive the news that the Christ child was born. 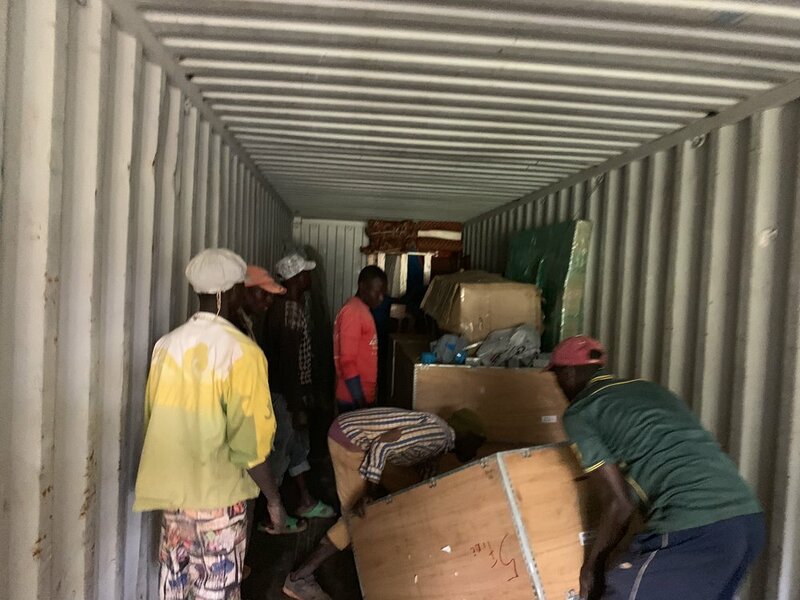 We had pre-packed a few Christmas presents on the shipping container for the boys to open – including two bicycles! But I think their favorite present was from one of their new friends who gave them Sally the chameleon. We also had some ministry opportunities in our community. The Wednesday before Christmas I had the opportunity to speak at morning chapel for the medical students, nursing students, and other hospital staff. I spoke about the glorious light that surrounded the angels bringing the good news to the shepherds and the star that lead the Magi to Jesus. I reminded them that the Bible calls us to be a light to the world (Matthew 5:14-16). Not to be perfect, just to shine the light that leads people to Jesus. I spoke in French just from an outline, which is different from other times where I have had a pre-written and memorized talk prepared. I praise God my language skills are improving and hope to continue to have opportunities to speak again. The Kibuye Christmas church service is always a big deal, but especially if Christmas falls on a Sunday like it did this year. Several groups – children and adults – form choirs and rehearse for weeks the songs they will sing, complete with typical African movement. The church asks that the Bazungu (white people) also join in and do a performance. So, I arranged a small Christmas Pageant to present to the church. Every part was played by one of the children on our team while the adults provided the chorale. With no Hobby Lobby or Walmart to help us with costumes or props, we had to get creative! Our dancing angels wore their daddy’s white tee-shirt and wings made from cereal boxes and toilet paper. The star of Bethlehem was propped up on a local bamboo stick. Our 12-year-old narrator told the story in French while our language teacher translated into Kirundi. We sang three songs throughout the play in English, French and Kirundi. Liam played Joseph and Zeke was one of the Magi along with his two kindergarten buddies. The kids did a great job and the Burundians loved it! Christmas afternoon a group of us caroled at the hospital and gave out small gifts like soap, blankets, baby hats and dolls and toy cars for the children. This activity was surprisingly arresting for me. I do not spend much, if any, time in the wards. Crowding in between beds filled with many times more than one patient per bed. Children with severe malnutrition, babies born before their due date, emaciated men with callused and dirty feet, women recovering from surgery… the list goes on and on. I found it hard to breathe and difficult to hold back tears. We shook their hands and said “Noeli Nziza” (Merry Christmas) many times. The kids enjoyed handing out gifts and the patients loved seeing the children. Zeke especially drew some attention with his cute yellow curls and readiness to sing. One mama came and just scooped him up into her arms! After the boys and I returned home from the hospital I burst into tears and just cried out to God until I fell asleep. Why is there so much pain, hunger and hurting? What can we do? I felt so helpless. We all want suffering to end, but all the hurting in this broken world will not be completely healed until Jesus Christ returns. But in the mean time, He has gifted each of us differently to do our part to love his people all over the world. There is always something we can do to show people His love. It’s truly amazing to see what God is doing through these Serge doctors here at Kibuye Hope Hospital. After one surgery the blind are seeing. Babies who normally would have died are saved by a c-section delivery. Malnourished children are being fed. Bones are being reset so that men may walk and work again. We are literally witnessing the blind being made to see, the lame made to walk. Please pray for our doctors here who are face to face with the extremely poor, sick and dying all day everyday. Pray for the work they are doing for these patients. Pray that their efforts would be multiplied in the years to come through the students they are teaching. And pray that we would not carry the burden to try and fix every problem that we would all simply would be a Light in the darkness – leading those we come in contact with to Jesus. We hope this update finds you well and enjoying the holiday season! Boxes may be stopped in Bujumbura (3 hours away) and steep tariffs at times have to be paid, but the large bubble mailers generally seem to make it all the way to Kibuye. I wish we could share some pictures with you. I have been trying for days to add some to this update and the internet is just too slow right now. Please pray for our internet to improve and for us to have patience as we deal with the situation. I'll try to upload more to Instagram and Facebook, that seems to work a little better. "Jewe ndagenda ku'bitaro kuvura abagwayi." We have been intensely studying Kirundi for the past couple months, and while we are no where near fluent, it is encouraging to be able to have small conversations with some of our neighbors. They are quick to laugh when we speak, but they are very gracious and also help us improve our grammar or pronunciation. I have been told that it is also encouraging to them that we care enough to learn their language, which is why we are taking the time to do it. Pray that as we slow down our study time, what we have learned will stick, and that we will find time to continue to work on improving our Kirundi. We are doing well as a family, we have settled into the rhythm of life here. Logan has started transitioning more into hospital work and teaching, and will be active full-time by the end of the month. We recently said goodbye to a group of medical students, and there is also a new group of students that have just started. They have been to Kibuye before but this is the first time Logan has gotten to work with them. Please pray he will get to know them quickly, be able to teach them well, and also be a spiritual encouragement to them. This season, we are learning a lot about appreciating things we often take for granted – for example, power and water. Water is pumped out of a spring up to the top of the hill to a large tank. If the power is out, or if the water table is low, there may be no water. In fact, we have been on “water-conservation measures” ever since we arrived, which means intermittent (and quick) showers, no wasting water, judicious flushing (yes it comes to that!) in an effort to conserve every bit of water that we have. We recently went through a 4-day stretch with no running water after the water pump broke! This was a difficult time, but I believe ultimately it was a blessing. We were able to more fully understand how our Burundian neighbors live day to day, and through it all we had “enough” – maybe not as much as we would have liked, but enough. God brought several good rainstorms during this time and we were able to collect water outside in large buckets. Christmas came early to Kibuye! When we packed our things in crates and put them in a container in Texas in the Spring of 2015 we were hopeful, but prepared that if something happened we might not see any of that stuff again. That was a year and a half ago! Although it took a while, we were finally able to get into the boxes recently, and it felt like an early Christmas! It’s funny how even something small, like a blanket, can invoke warm feelings and special memories of "home". We also unpacked our Christmas decorations from our crates and put up our tree and are now enjoying Christmas carols on the iPod, albeit in 80-degree weather. We hope your holiday season is filled with love, peace and joy! What does life in Burundi look like? I mean, how would you feel if you woke up and a stranger was screaming bad French at you? "Are you the One who is to come? Or should we be looking for another?" Sitting in that room, surrounded by criminals, I happened to think that Jesus was hung on the cross between two criminals. He loved them, he died for them, and even in their last breath they were given the opportunity to be forgiven and saved. I have to share this amazing testimony and praise report! To set the stage: yesterday we took the boys to a popular ski destination about an hour away so they could ski for the first time. They both loved it and really took to it pretty naturally. I was wearing ski pants which don't have the normal pocket for my wallet. As we were about to get in the car to leave, I felt around in my pockets and then had that sinking pit-of-your-stomach feeling when I realized that I couldn't find my wallet! I flipped into panic mode. Immediately, the Lord provided a blessing as we ran into some friends of ours from our language school. Imagine, I probably know fewer than 50 people in all of France, and what are the chances I would run into one of them in our hour of need in the middle of a busy ski resort in the Alps? They prayed with me and loaned me some money so I could buy the kids a snack while I retraced all my steps from that day. I wandered all over the mountain and reported the incident to the local authorities. The cynical part of me thought "Why bother?" About two hours later, with no luck, we finally left. We talked about it with the boys in the car on the way home, and we all prayed that God would help us find the wallet. Zeke even thanked God in advance in his prayer for returning it. I felt my faith being lifted by my boys prayers and the expression of their faith, which is and should always be child-like. This morning, I went to my local bank and reported the loss and ordered a new bank card. When I got home, I saw a new facebook message from someone that I do not know. He must have tried to translate a message into English: "Hello, I work in bus transport on a conductive Albertville my report card with a door driving license, credit cards." My first thought was that this was a Google Translate disaster, and also about how awful I must sound as I try to speak French here everyday, but I was intrigued by the mention of the driving license and credit cards. I replied back, in French, and asked if he found my wallet. "Oui." Fist-pump! I couldn't believe it! How unlikely that it would turn up at all, much less that it made its way back to Albertville? I met him a few minutes later and he explained how a bus driver found the wallet in the parking lot and looked inside for information. My drivers license is from Missouri, so no help there, but there was a business card for a coiffeur (barber) here in Albertville. They called my barber, who remembered me and confirmed this was a current address, and they sent the wallet back to Albertville and then looked me up on Facebook! In less than 24 hours, God had miraculously and perfectly resolved this crisis. It was great to share this good news with the boys as well, so we could see how God answers prayer. I hope it is uplifting and encouraging to you today as well. Each morning one of the students in our language school leads a devotional. These are done in French, and is a way to encourage each other as we study French and also to practice speaking and understanding the language. There are many students who have been here for almost a year already, and they were initially the ones leading the devotions. Now the classes who have recently arrived are beginning to lead them. Last week, it was Julie's turn. She gave the devotion in front of the entire school, in French. In the video, she tells a story about an old pair of Liam's shoes that we brought with us, but which were beginning to wear out. She bought him a nice pair of new red shoes, but the problem is, they have laces, and Liam had not yet learned how to tie his shoes. While he wanted the new shoes, he didn't think he could learn this new skill and was more comfortable holding on to his old shoes, even though they were too small, had holes in them, and just weren't working properly anymore. She sat down with him and practiced over and over until finally he figured it out. It was frustrating at first, but with perseverance now he can tie his own shoes! She related this experience to learning French, and how even though we want to speak this new language, it is difficult, and often times it is just easier and more comfortable to revert to speaking English. But there are "new red shoes" waiting for us to wear if we have the persistence to learn how to tie them.